When the treaty ending the Winter War was signed on March 12, 1940, Joseph Stalin drew his fat Cosmos pen across a large-scale map in the Kremlin, creating the new border. The line that was a couple of centimetres thick on that map turned into an ambiguous strip of terrain a couple of kilometres wide. Did the border run along the western or eastern edge of the line? There had been no discussion of this minor issue in Moscow; the decision was turned over to the men in charge of establishing the border in the field. 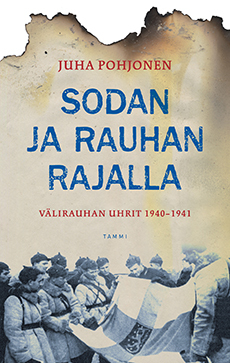 When negotiations began in March 1940, the mood at Finland’s eastern frontier remained tense. Soldiers were on hand to ensure the safety of those surveying the new border. The Finnish negotiators argued with the Soviets over every village, house and peninsula, and the Soviets suspected the Finns of trying to reclaim lost territory. Anyone who crossed the border without clear cause was considered a spy, especially by the Soviet Union, which pitilessly exercised its power as the stronger country. Finns started disappearing, the first even before the negotiations began. Who were these Finns who vanished? Some defected; others couldn’t believe Karelia had actually been lost and “went home.” Soldiers were constantly being kidnapped, some were murdered, many disappeared altogether. The last man to come back was kidnapped during a fire-fight in 1940; he returned to Finland in the late 1950s, but the majority never did.